If I... had a house in the burbs you KNOW these would be out front! ...Or a condo with a porch...or anything but what I have now with a indoor hallway. Aren't these fun???? I would figure an way to paint the numbers to make it last all season, and maybe do another special carving for the Kiddos and parents out Trick-o-treating! Our house number would be 5 pumpkins long! 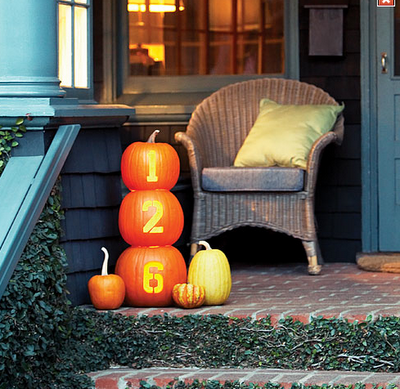 i have a front step, but the hoolies in my hood would steal them after i spent 14 hours carving my numbers in them. college kids. sheesh. This is such a cute idea! I would have to paint them though because my carving skills don't extend past triangles and half moons lol.